If you think vodka is Russia’s national drink, think again. A curiously satisfying, slightly alcoholic, mildly sparkling golden brown beverage called kvass has been slaking Russian thirsts since ancient times and is enjoying a lively patriotic revival today. Classic kvass has the texture and tartness of a mildly alcoholic cider and is made from fermented black or rye bread, spring water, and herbs, though versions of kvass are also made with berries, other grains and beets. Kvass is consumed both on its own as beverage and also as the base for summer soups such as okroshka. Now that summer is here, almost every street corner boasts the ubiquitous yellow and red kvass tanks, which dispense the thirst quencher throughout the day. Today, kvass is commercially produced by large bottling plants and sold in supermarkets in plastic bottles all year round – a million dollar business even the Coke and Pepsi people are in on. 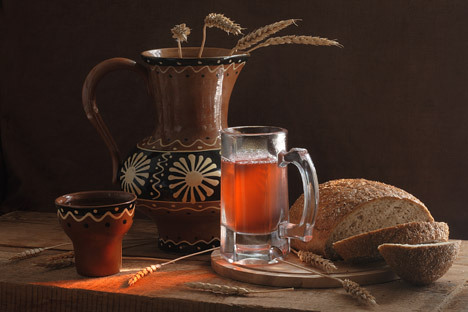 This development is regarded by many Russians as a slightly vulgar commercialization of a national treasure, though everyone agrees that kvass is vastly superior in taste to foreign soft drinks. The best kvass is made at home, from scratch, and the very best kvass for some reason, is found in Orthodox monastic communities. Kvass mild enough to give to children and is certainly much healthier than soft drinks of sugary juices. It’s also a great way to use up stale bread. So -- give kvass a try. You may find it grows on you! Feel free to play around with the ingredients until you get a taste you really enjoy. Adding a little ginger and lemon peel has given my kvass its signature taste. Experiment to find yours! - 750 grams of dried or stale rye, pumpernickel or black bread, cut or crumbled into small chunks. Russian “borodinsky” produces the best taste. 1. Bring the water to a rolling boil in a large soup pot with a tight lid. 2. Arrange the bread chunks on a baking sheet and bake for 30 minutes at 180 C (350F) until hard. If the bread is already stale, then bake for just 15 minutes. 3. When the water comes to a boil, remove it from the heat and add the bread, and stir briefly to combine. Cover tightly and set aside for five hours. 4. Line a colander with layers of cheesecloth and set it over a clean bowl or pot. Strain the bread and water mixture through the cheesecloth, using the back of a wooden spoon to press the remaining breadcrumbs to get their flavor. Discard the breadcrumbs. 5. Combine the yeast with the warm water and set aside for 2 minutes to proof. 6. Add the proofed yeast, sugar, lemon zest and ginger to the liquid, cover with towel and set aside overnight (8-12 hours). 7. Strain the liquid through a sieve, discarding the ginger and lemon zest, then decant into the glass bottles, taking care not the fill the bottles all the way – leave sufficient room for the fermentation process to continue. Add a handful of raisins to each bottle, then cap or seal the bottles and set aside for 2-3 hours. Chill in the refrigerator for 2-3 days before serving. Long time resident of Moscow, Jennifer Eremeeva is a free-lance writer and photographer. She is the creator and curator of The Moscovore, a web site dedicated to finding, cooking, and enjoying great food in Moscow, and Russia Lite, where she blogs about the funnier side of life in Russia.